If you love a woman and are reading this blog, married, mated or single, this might help you understand her a tiny bit better: surrender. When she sees everything in chocolate, surrender. When she wishes for double cream in her eclairs, surrender. When she sneaks that last piece of caramel cake for a late night snack, surrender. Every month I go through a one week citrus fest and B. surrenders. I can't get enough vitamin C in my body and he laughs at the dessert scenarios I create to get my fix. He does not seem to mind the latest onslaught of Key lime mousse, grapefruit sorbet, citron givre and this Lemon Poppy Seed Cake topped with a Meyer Lemon Mousse. The strawberries...I thought the touch of red would tell him I love him too (wink). I love when it happens in the middle of winter since the selection could not be more perfect. I guess there could be worse cravings than this, right? Mine usually veer to chocolate and stinky cheeses after 4 days but after 10+ years together, B. knows, and as long as I don't combine some stinky Livarot and chocolate cake at the same time, (not that I ever did or will), he's pretty happy with the dessert choices. Most days are simple like half a grapefruit sprinkled with a little sugar and quickly broiled for a little sweet crust, fresh orange slices and mint salad. Some days it is a bit richer and then we split or we take it next door and share. Knowing that there is a gathering of some sort almost every Saturday around here, I made these individual cakes not knowing for sure their upcoming fate. Will they be all mine? Nah....! They helped a good game of Scrabble with our good friends last until the wee hours of the morning. The cake base is a straightforward lemon poppy seed cake jazzed up with Meyer lemon zest and juice. Why Meyer lemon? It's mild, fragrant without being offensive to your palate or your stomach. Next to my childhood "citron de Menton" (which we celebrate almost as much as Carnival), this is the one that sends me into citrus heaven so when they started popping out at the stores, I hoped, skipped and jumped...Feel free to use any other kind. The mousse base is a simple diplomat cream (pastry cream based) with lemon juice and more zest added. I did save half a lemon to candy some slices for decoration and almost slapped myself for not making more...they were so good on their own. The recipe may look like a lot of work but really beside making the cake and the mousse, the rest is assembly. Kitchen Note: You can build this cake as one 8-inch round cake if you do not have cake rings, or three 4-inch round individual springform pans. The cake won't be as tall built in an 8 inch so I'd advise doubling the mousse recipe. You can also do what I tend to do and recycle cans of tuna, wash them well, remove the top and bottom lids and line them with parchment paper or film strips like you would with purchased rings. I am also known to recycle soup cans if I need to build tall individual desserts. The ones I used here were 3 inches wide and 2 inches tall. Preheat oven to 300F. In a bowl, combine all the dry ingredients for the cake. Set aside. In a separate bowl combine the egg whites and the milk. Make a well in the center of the flour mix and slowly add in the egg white mixture while stirring with a whisk. Add in the lemon juice, zest, the poppy seeds and the melted butter. Mix with a whisk until smooth. Line a half sheet pan or a 9x13 inch pan with parchment paper, lightly spray with cooking spray and pour in the batter. Bake for 20 minutes or until a toothpick inserted in the center comes back clean. Let cool and cut out six 3-inch rounds to fit your cake rings. Line 6 cake rings with parchment paper or rhodoid (pastry film, but cut sheet protectors work well too), secure with tape if necessary and place your cake bases at the bottom. Place the cakes on baking tray. Set aside. In a small saucepan set over low heat dissolve 1/4 cup lemon in 1/4 cup of water with a couple of tablespoons of sugar. Let cool to room temperature and brush the cake rounds with the syrup. Quickly wash the strawberries, pat them dry and slice into 1/8 inch to a 1/4 inch thick slices and line the cake rings with them. Set aside. In a ramekin, sprinkle the gelatin over the water and let stand until you prepare the cream. In a medium bowl, whisk the sugar and egg yolks together, add the cornstarch mixing until you get a smooth paste. Set aside. Meanwhile in a saucepan combine the milk and vanilla bean on medium heat until boiling. Remove from heat and add slowly to egg mixture, whisking constantly to prevent curdling, (pour through a strainer if this happens). Remove vanilla bean. Place the egg mixture back into a medium saucepan and cook over medium heat until thick, stirring constantly. Add the lemon juice and zest, cook another 30 seconds and remove from the heat. Immediately add in the gelatin and stir until completely dissolved. Place a piece of plastic wrap on the surface of the cream so that it does not develop a skin as it cools to room temperature. Whip the heavy cream until stiff peaks form and gently fold it into the pastry cream. 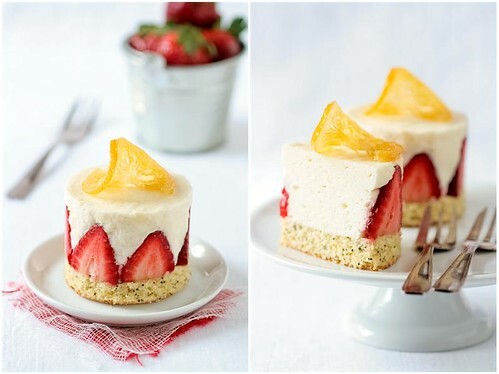 Pipe or spoon the mousse immediately in the cake rings, level the top with an offset spatula and refrigerate. If you have any leftover, spoon into dessert dishes or glasses for quick snack. ¡¡Tes gateaux sont trés belles!! Love eyer lemon, and I am very lucky to have 3 small trees in my backyard. Let me know if you need more, he...he...he.. Lovely!!! Though I'll have to wait till spring to try these. So pretty! A delightful combination of delicate flavors! These are absolutely beautiful! I love Meyer lemons and how all the citrus is so fresh in the winter too. we should make all husbands read this. yes, surrender because you will not win on this one. not when it comes to dessert! we are definitely sharing the same brain since lemon, cream and berries has been on my mind too. so refreshing! This reminds I haven't been using enough meyer lemons in my daily baking! Those little mousses look wonderful! what can i say?? this gets my thumbs up! meyer lemons are fantastic! This dessert is fantastic. I just want to take a fork through my monitor and dig into to that! Beautiful! And I like that first line - will make sure he sees it:)! I think I will spend to day reading this and copying recipes. :) thanks so much for sharing! gorgeous and lemon is one of my favorites along with grapefruit and blackberries. but, lemon to me is delicate and sunshine. I can relate to the citrus craving! These look so delicate and lovely! It looks too pretty to eat!! These look delicious, and that late night Scrabble game sounds like a good time! Long time reader but first time leaving a comment: absolutely gorgeous! The flavors had to be exquisite and your photography is through the roof! 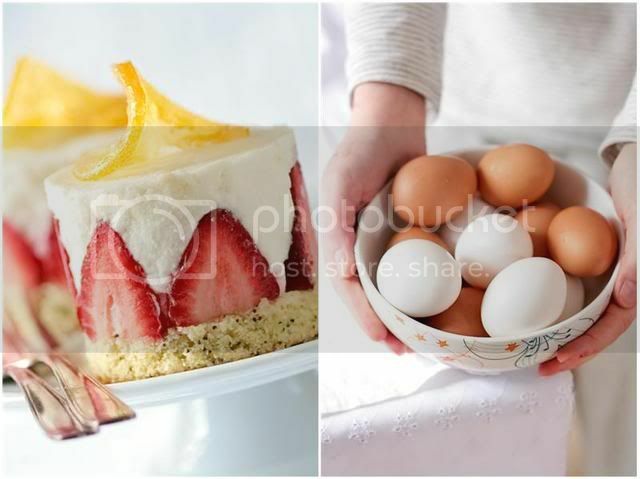 Love the middle shot with the tilted cake and the bowl of eggs. Not only visually drop-dead gorgeous but all the flavors that this woman would gladly surrender to ;) A wonderful idea for Valentine's Day. My daughter spent 5 weeks in Menton when she was 15, lucky girl. Such a beautiful place. I just love how you inspire us to think creatively and have fun with creating desserts! I also love it when you gave ideas on how to recyle cans and gave them second use! Thanks for sharing and for this wonderful posting! I love meyer lemons, and have been keeping an eye out for them in my grocery store. Looks fantastic! I have stopped bookmarking your recipies as everytime i come here they all are looking so delicious. Haha, I remember once thinking that this is the great thing about lesbian relationships - women understand these food freak-outs and are positive about them, so that together we can stick our heads into the pint of ice cream or pig out on gobs of cheese without having anyone raising an eyebrow. That dessert looks fantastic, as well. hehehe...I've been trying to figure out a way we could have citrus trees at the house but apparently they attract roof rats and are a real problem in California. I totally understand the citrus compulsion. These are lovely as always. I particularly like the last dyptich. Great cake! Love the strawberries round the edge. Loving the photography too. Very light, fun. delicious helen! i have been spying meyer lemons and all sorts of citrus in the stores...what a wonderful time of year. the red strawberries add just the right pop of color. lovely. oh, and i always try to hint that if my fiance gives in it will be easier on the both of us...and probably more rewarding in the end for him too. must be meyer lemon season in the south, you and Aran are twins! im jealous, i feel like i have Stockholm syndrome...great oppening lines. i just realized: i can't wait for valentines day! i wasn't part of food-blog world much last valentines day, i bet it will be fantastic! beautiful desserts~~individual as always, i think if i see a dessert family style i will smirk at it and turn up my nose! what a snob ive become, brilliant! That Girl: don't be afraid to try though because once they are well washed, there is no smell coming out. I keep cans of coconut milk that I use as entremets rings also. I just can't seem to purchase more when just a look around the pantry gives me all I need! Lovely as usual. I make a white chocolate cake that has a strawberry carousel around the outside similar to your cake. It is always so well received when it comes to the table. Yum yum amazing - look at those fresh strawberries!! Mmm, I love your mousses. I have me a bunch of Meyer lemons right now as well. I love how bursting of freshness these are ! The pictures pop, the recipe pops! this is TOO good!!!!! It's good for any one to understand these things about a woman...the sooner people learn it the better. I need to taste these right now! what a fantastic combination of flavours...& so beautiful! I too just made a poppy seed cake and it's such a delicious dessert. Paired with lemon and strawberries, it must be heavenly! I am so glad you stopped by to tell me that you liked the carrot Halwa. I am not fond of carrot myself but the halwa masks the smell and taste of carrot. The carrot kheer is something you might like as well. Your blog here is a treasure trove of cakes, cookies and ofcourse tartlettes that I can only dream of making one day. The photos are amazing! I'd like to have one of those desserts right now. I'm seriously tempted to ask you to marry me Helene. How beautiful and so enticingly fresh looking! I want a bite! Wish I could get my hands on some Meyer lemons just to experience the difference. I love that poppy seed crust, it all looks so refreshing. Would it be alright to include a link to this post in the Meyer lemon round-up I'm having? Let me know. Thanks! My english is very bad but I hope you understad me. I visit your blog very much and only can you say that is fantastic your recipes are incredible and fantastic presentation. If I better understand the English would make all your recipes, you could think of publishing them in Spanish ok? While I will continue to visit your blog to see these wonders. Add in the poppy seeds and the melted butter. except the butter. I love the crust on this dessert. Plus it is gorgeous. I don't know if I could eat such a gorgeous dessert. Ok, I am sure I could manage! Oh you brought up some fond memories. When I was younger my grandma use to bake this poppy seed cake that ever so often crave. I love anything tart so this is one I would like to try. Where would I find the cake rings? Anything lemon sounds good to me. I think I love lemon as much as I love chocolate. I always have them, although I have not had the opportunity to have a meyer lemon yet. MaryMary: I am not sure I understand you correctly. Do you mean for me to translate them into Spanish or you to publish in Spanish? Looks good enough to devour straight off the screen! I've never tried anything this complex, but I just might have to now...especially since it incorporates two of my all-time favourites: poppy seeds and citrus/lemon! Once again an absolutely gorgeous creation. I also go on binges like this although lately for me it has not been citrus. All i've been craving is sweet potatoes, sliced and roasted until crisp then dipped in a simple dip of yogurt mixed with paprika. I've had it three times in the past week and am already planning to buy more. And like yours, the man in my life smiles and allows my obsession (he even steals a slice or two for himself). A recycling star is born! Expensive kitchen gear for free. Almost as beautiful as these desserts - ok it's as utilitarian as these are beautiful! Oh, Helen. I am so making these. Everything I love so much is in here. I recycle some of my tins too, it's amazing how many different sizes there are! I love meyer lemons. I order mine by the box from www.lemonladies.com. They are just fantastic, fresh, juicy and I have never been disappointed. I shall be making this right away! Thanks for the beautiful post. Saving tuna and soup cans for building desserts is genius! I hope the husband will "surrender" to me "collecting" more stuff in our tiny kitchen - the reusing aspect of it should appeal to his frugal nature. And there'll be cake! :) These cakes are gorgeous - thanks for sharing them! Cheers. These look absolutely wonderful! One day I will cross the ocean and try those famous meyer lemons! I really want to try these! Just unsure of how to do the tuna can trick- what i am imagining is that both ends are out of the can and you are left with just a ring. Is that right? then you line the sides and make a new bottom with paper? Btw, the pics are beautiful. Hope mine turn out just as well! 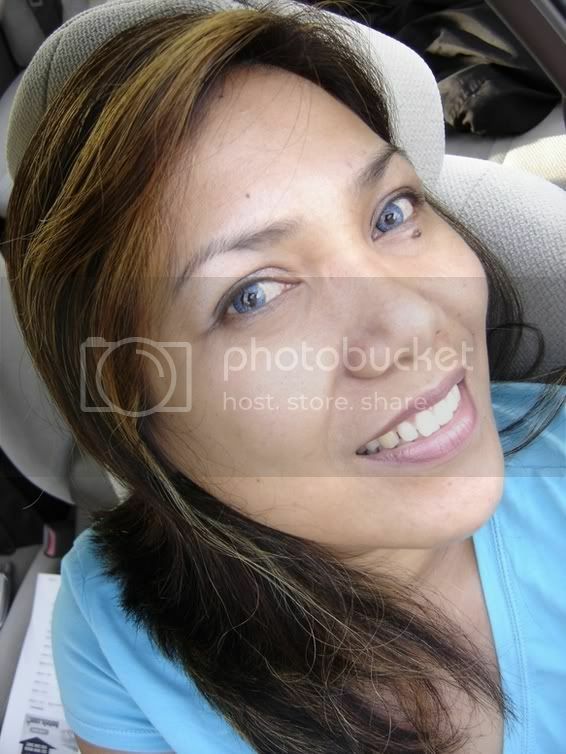 oh Helen, looking at your pictures make me really happy. Especially now that I am living in a "dungeon" with not much natural light, photographing my food is almost impossible! Lemons and strawberries... to of my favorite things. I love seeing all the desserts you come up with. I've been thinking about pastry rings for a while so I will definitley use your tip next time I have a can of tuna. Beautiful! I get what you mean about being on a vitamin C kick. I have a great avocado/citrus salad that I've made 3 times in the last 7 days! 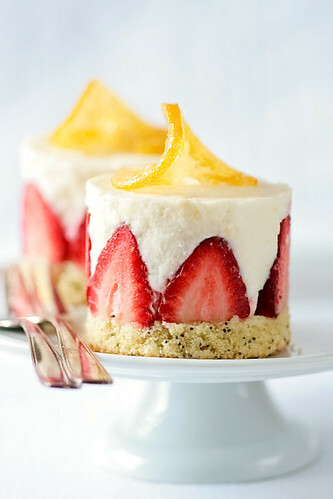 But, getting the vitamin from a dessert as gorgeous and delicious as this would be more fun! Your desserts are so beautiful. I can't wait to try them out! Janine S: the instructions are in the "kitchen notes" section of the recipes. A serious showstopper of a cake if I've ever seen one. Thank you for the sweet and bright respite from a dreary Seattle day! Just reading about the bright sunny citrus flavors makes my day sunnier! I'm just loving all the meyer lemon desserts lately. This looks so elegant and dainty, yet, I want to devour it completely. These look great! You have the luckiest neighbors, getting to sample all your amazing creations:-) Question, do you use cookie cutters to cut the rounds? That is a lovely lemony creation! My hubby would think he had gone to heaven if he just had a smidgeon of what you make! Simply beautiful creation (again)! Marc: you can use a cookie cutter the same dimension as you cake rings but I usually use those and push them through the cake. We are eating the meyers from our trees now. My three-year-old, soon to be four, decided he wants THESE for his birthday cake when he saw them! I'll have to try making the candied lemon slices with the rest of the lemons; thank you for the link to the recipe for those as well! m adding u to my roll...wow! so beautiful done and neat! I don't think I can make this! I could eat a whole batch of these in a split second. And I don't even like poppy seed. Wonderful! Beautiful, as usual. I love your tip on using recycled cans- brilliant! I'm most intrigued with the Meyer Lemon Mousse. Will be using that for something in the future, I'm sure! Thanks for a lovely recipe. This looks so delicious, I do not know what to say! This is my first time stopping by, via La Tartine Gourmande. I will be back for more mouthwatering recipes! Sorry, my English is very bad. I would like to publish recipes in Spanish too in order to make your wonderful recipes, as I don´t understand very much English. I hope you understood me. I am so inspired - just looking at the photos of your creation is enough to bring on sunshine and happiness! Marymary: I am afraid I am not able to translate the recipes in Spanish because 1/my Spanish is probably worse than your English and 2/ I am short on time. If you want to make them I suggest running them through a google translator and if you want to put them on your site and link back is always appreciated. OH MY...these look fabulous! And what a terrific idea about the tuna cans...I'll have to remember that! I'm sure the world wouldn't need any vitamin c tablets if we can all have your citrus dessert every day!! Actually, I would really like that, hehe! Beautiful!! oh, I just found some meyer lemons after years--my most favorite fruit. these little cakes make me yearn for summer! Helen-I made these last night and they were FABULOUS! Both the cake and mousse were incredible independently as well. I ended up making them in mini cheesecake pans, and they came our perfect! Thanks!!! .. came here through flickr, your pics look deliciously :-)!! Alas, I had to borrow an 8 inch round; I only have a 10 inch round. I see 4 inch rounds in my future now; any suggestions on where to purchase them? In the 8 inch, the mousse is really short. I used Aran's chocolate biscuit from Cannelle and Vanille instead of the poppyseed cake, and topped it with frozen blueberries instead. The blueberries don't take up as much height as the strawberries, to be sure, but it's still a bit short, so I am thinking it is my 8 inch round (also, this would be less fruit in general taking up space). I put a few blueberries in the center for when it's cut. Also, thank you so much for the gelatin teaspoon measurements! I don't have sheets; I used powdered gelatin instead. Estie: I am glas you tried it and it had such raved reviews with your family! Pruedent homemaker: for 4 inch rounds, there are individual springform pans that are that size and sold in a pack of 4 on amazon. You can also find 3 to 4 inc rings at stores like Michael's where I found mine and there were $1 a piece. I lined the outside with parchment paper to build in height. I used 4-inch springform pans. Hi Helen, I just wanted to let you know that this weekend I tried your recipe and it came out really great! :) Thanks! How far in advance can you make each part/the entire dessert? Thanks! Christine: You could make the cake the day before or 2 days before. The soaking syrup can be made up to a week before and kept in the fridge. The mousse needs to be made right before you are ready to assemble because it sets within a couple of hours. The candied lemons can be made up to 5 days in advance and stored in their syrup in the fridge. For the cake, it does not say when to add the lemon juice and zest. Is this mixed with the milk and egg whites or is it added with the butter? I wasn't sure if the juice would curdle the milk. Thank you again! Christine: thanks for noticing that and sorry about it too. The lemon juice and zest go at the same time as the butter and poppy seeds. I am making your poppyseed cake recipe again today for a Mothers day dessert. Instead of making the mousse(will do soon) I topped the rounds in glass dessert cups with macerated strawberries (sugar and lemon juice) homemade whipped cream sweetened with agave syrup and vanilla bean. Topped with the candied lemon you linked here...I used the simply syrup leftover from making the candied lemon as the glaze over the poppyseed cake (worked wonderfully) this made for a very pretty presentation and I cannot wait to show it off again tomorrow! Thanks for sharing, you have fantastic recipes and ideas! Can these be frozzen and if so for how long? Barbara: I would not freeze those because of the strawberries. They will turn grey and mushy upon thawing.